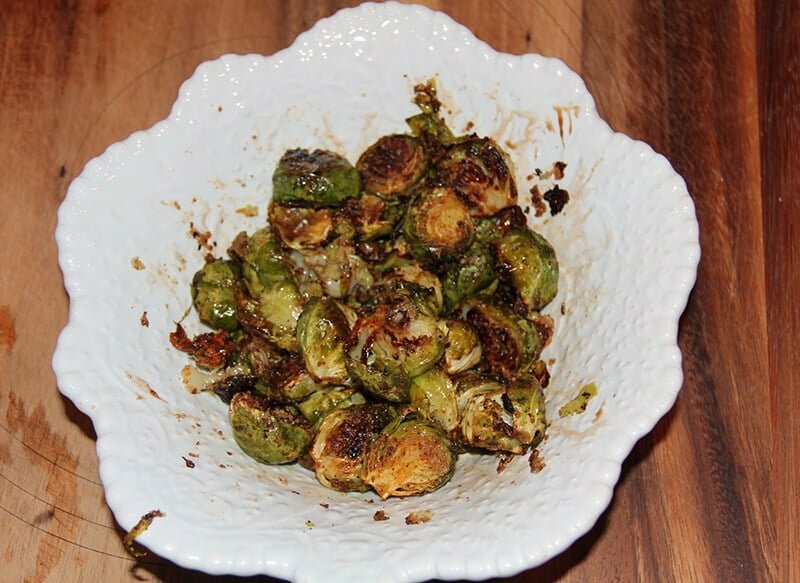 Roasted Brussels Sprouts, caramelized with a little brown sugar and spiced up with some chili powder and cumin…these are divine! My grandfather did not grow Brussels sprouts. He grew cotton for a few years, corn, peanuts and soybeans—and he would fall over laughing if he knew that people now pay good money to eat soybeans right out of the shell and call it edamame. In the garden, he grew green beans, butterbeans, tomatoes, potatoes, okra, cabbage and other vegetables that we ate on all year long. But no Brussels sprouts. Never grew them, never ate them. The only time I even tasted Brussels sprouts was at a friend’s house and they were cooked to mushiness, bitter and blah. I hated them. When I was all grown up and in charge of my own kitchen and running out of ideas of what to cook, I tried Brussels sprouts again. I bought a box of frozen sprouts and cooked according to package directions. They were mushy, bitter and blah. I hated them. Well, guess what? I have figured out how to cook Brussels sprouts and now I LOVE THEM! We had dinner last year at a favorite local restaurant, Fusco’s, and the chef served Roasted Brussels Sprouts with whatever dish I had ordered. His were sautéed, not actually roasted in the oven, but they were so delicious. I knew I had to give them another try at home. My standard way to prepare most vegetables other than beans is to roast them with olive oil on pretty high heat in the oven. I love the way the vegetables caramelize slightly and develop a richer flavor than if steamed or sautéed. 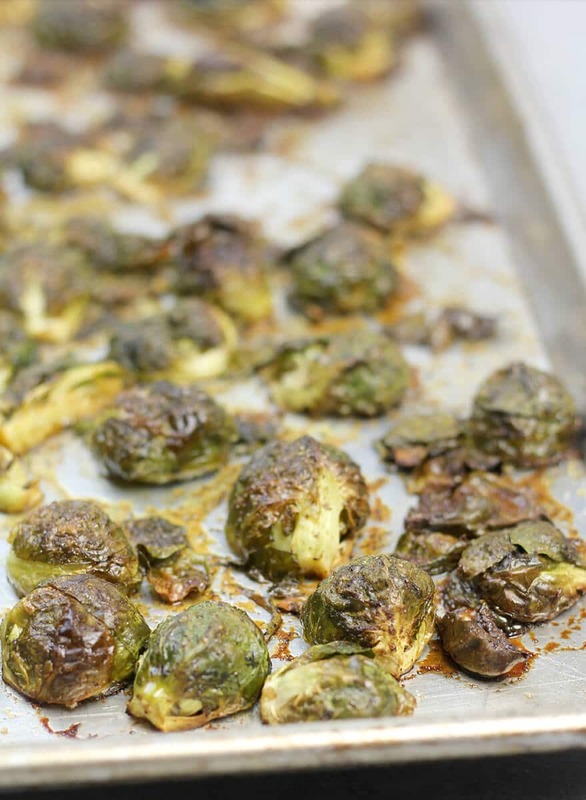 And turns out, Brussels sprouts are perfect for roasting in the oven. Start with 3-4 cups of fresh Brussels sprouts. Trim off the ends and cut them in half. If any of the outer leaves fall off just include those on the pan—they will get crispy and brown, yum! 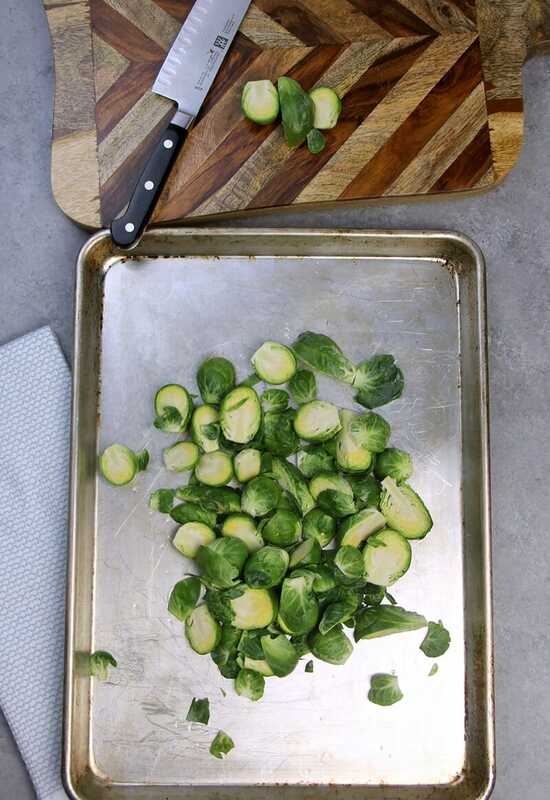 Place the trimmed sprouts on a baking sheet that you have sprayed generously with cooking oil. Then sprinkle cumin, chili powder, salt, pepper, and 3 tablespoons of olive oil over the sprouts and toss with your hands. Now spread those sprouts out so they have plenty of room to breathe on the baking sheet. You may need to use two baking sheets. If you try to stuff too many on there, they will steam instead of roasting and then they’ll be mushy and blah with none of that delightful brown crispiness that you’re trying to achieve. 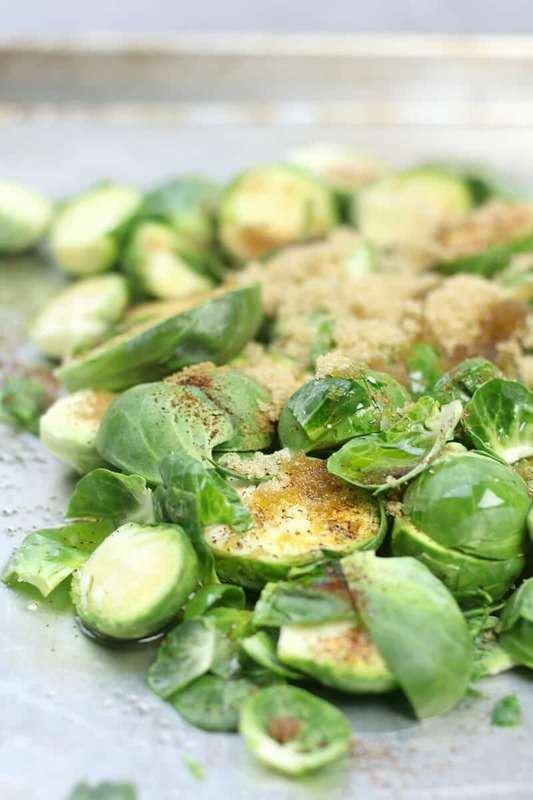 After you have the sprouts well spread out, sprinkle 2-3 tablespoons of brown sugar over all of them. This is the secret. 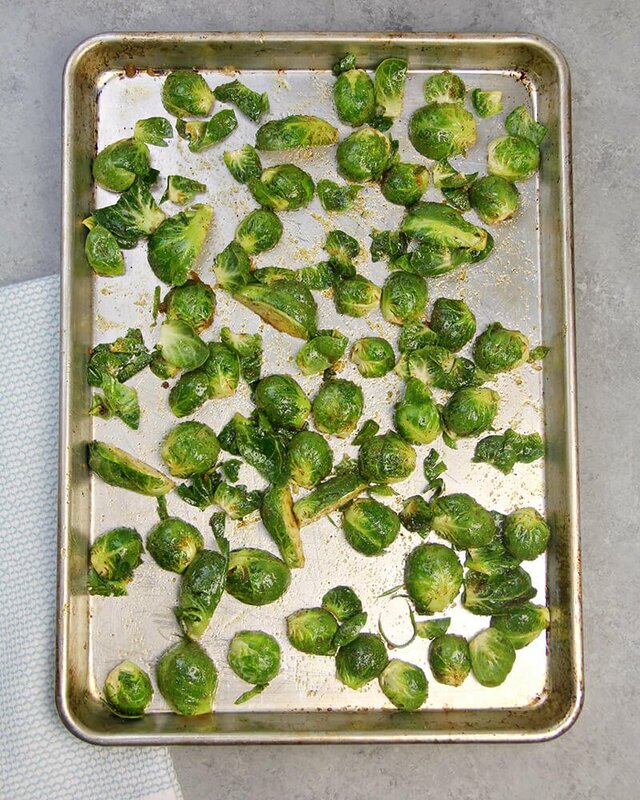 The sugar will caramelize and help turn the outer leaves of the sprouts into a crispy, savory-sweet, scrumptious vegetable that you’ll be ready to make again very soon. Roast at 425° for 25-35 minutes. You can take the pan out halfway through and turn all the sprouts over so they crisp on both sides, but I usually don’t even bother doing that. This has become one of our favorite and regular fall dishes and goes well with just about anything. We often enjoy these Roasted Brussels Sprouts with spaghetti squash for a nice vegetarian dinner. Roasted Brussels Sprouts, caramelized with a little brown sugar and spiced up with some chili powder and cumin...these are divine! Preheat oven to 425. Spray large baking sheet generously with cooking oil or line with foil and spray the foil. You can also use parchment paper. 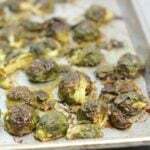 Place Brussels sprouts on baking sheet and sprinkle with cumin, chili powder, salt, pepper, brown sugar, and olive oil. Toss sprouts gently with hands. Spread sprouts out over cookie sheet so there's space between each one. Roast for 25-35 minutes, until brown on the outside and slightly crispy and tender when tested with fork. Can I get the same results with frozen Brussels sprouts ? I have never used frozen Brussels sprouts so I honestly don’t know. I’m not sure you would get the same caramelization and crispiness around the edges though. But if you try it please let me know. Thanks!